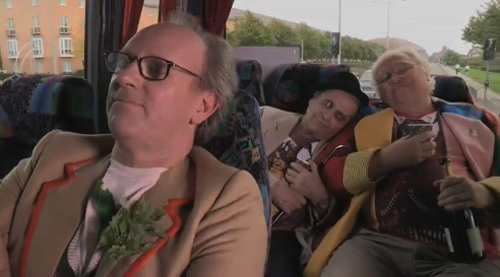 Being a Doctor Who fan in 2013 presents such a vast array of experiences, such a broad variety of access and media in which to enjoy the series that in its semi-centenary this fan was able to watch three celebratory programmes across a terrestrial channel, pay-TV channel, and finally the internet. When I was a lad of 18 Doctor Who turned 25. It seems now that there was one holy week dedicated on New Zealand television (which at the time comprised of two channels) dedicated to the show. The truth is, the coverage of the show was handsome, but not actually that exhaustive, contained as it was to largely non-primetime transmission hours. Twenty-five years on, and an entire weekend of back to back Who on UKTV, plus Prime’s twice-screened broadcast of The Day of the Doctor (not to mention those 3D cinema screenings for fans lucky enough to get the tickets), plus of course the monolithic internet coverage sees the 1988 marathon seem positively quaint. If Steven Moffat’s promise of Doctor Who ‘taking over television’ were to have been a promise made real, then surely it happened here. What follows then is a potted review of three individual celebration shows from the past weekend. If Mark Gattis ever considered a tilt at the position of Doctor Who showrunner, then consider this his major frontal assault. AAISAT is a visual feast, not only for Sixties-philes such as myself (and I was as much enthralled by the real-life period detail as I was the faithfully-replicated shooting scenes), but for anyone interested in the history and miraculous birth of a TV legend, this 70-minute docudrama comes highly recommended. 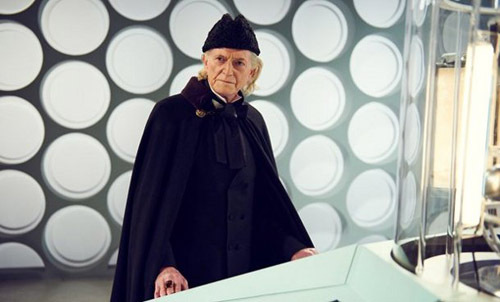 David Bradley is in turns virtually indistinguishable from a version of William Hartnell which surely resides in the collective living memory of those who witnessed Verity Lambert’s days of pass and vinegar. Doctor Who’s series creation myth proves to be as enthralling as the series’ first episodes themselves, and Bradley’s Hartnell is a portrayal of studied restraint. In stark contrast to the hyperactive man-child of the Twenty-first century Doctor, Gattis’ Hartnell is a man plagued with self-doubt, seeing all too clearly the opportunity of a lifetime slipping from his grasp, and becoming with every year more reliant on the indulgence, the patience and support of his producer and co-stars. The end, inevitably, is heartbreaking. A work of devotion, this drama is the clear highlight of the anniversary weekend reminding us of how close we came to having nothing to celebrate at all, and of the fragility at the heart of Doctor Who’s most critical years. Consider me a Gattis convert. Simulcast bar-ten minutes (probably enough time for Strax’s pre-screening announcement then), this special is a strange beast. Not entirely the all-in celebration some fans may have wanted it to be, yet possessed with the confidence to build not on a fifty-year old myth, but an eight year old one instead. TDOTD unashamedly looks forward, doffing its coat-tails to the series heritage, but determinedly pushing into the future, where even the reinstated elder statesman of Doctors has been recast as a possible future incarnation (a clever trick – wonder if there are three to six other future Doctors with oddly-familiar faces out there?) It’s an unconventional special, and an anniversary sometimes in name and cameo alone – a former Doctor is brought back (verdict? Too soon!) , and a new former Doctor installed; numbers get juggled, doubles are played off against one another (the story’s Zygon gambit being one strand I felt was less than essential), and via John Hurt’s War Doctor some curious reinventions of the show have been wrought – as some are calling it, a ‘soft-reboot’. 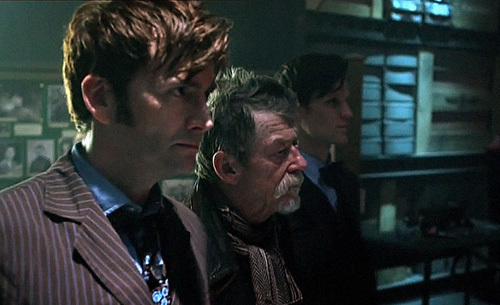 Outside of the Time War the story, too, is a little static, recalling the quieter moments of The End of Time during the Tower scenes, where three incarnations of the same Time Lord get to play a game of ‘Won’t somebody think of the children? !‘ over fallen Gallifrey and its late, lamented may poles. But, churlishness aside, this is a nice diversion, and doubtless the central picture would have looked brilliant in 3D. 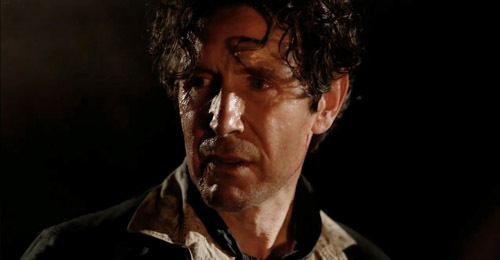 Onl;y one real niggle: for all of his darkness and terrible nature according to Moffat, how did John Hurt’s incarnation end up so damned sympathetic and lovable? I’m so glad I saved this for last. Peter Davison’s irreverent story of Time Lord irrelevance is an equal and equally affectionate tribute to the parent series and its triumphs, failures and just odd lineage as Gattis’ earlier feature. Everyone in this production is clearly up for more than a little self-parody, and the result is blissful. I can’t decide who was gamer, between a certain late companion, John Barrowman or Russell T Davies, but I watched this with a near-constant grin on my face and a giddy sense of empathy for yesterday’s heroes, aching in limb, frequently out of breath and distressingly squeezed into increasingly ill-fitting costumes. I’m even smiling looking at the above picture as I type this. Did the three musketeers really pull it off as depicted? I want to believe they did! And so, comedy, drama, flash and verve, with some nostalgia and humanity in the mix. Truly, to get the full Who anniversary viewing experience you didn’t just have to be there, you had to be everywhere.